An ABC/WAPO poll found 66% see Trump as doing more to divide than unite the country. Just 37% trust Trump on his handling of N. Korea. Eight months in, the ABC/WAPO poll found Trump’s approval at 39% (57% disapprove), the lowest approval level since Truman’s presidency. St. Louis Post-Dispatch reported more than 120 people were forcibly arrested in downtown St. Louis by police cracking down on protests. Numerous innocent bystanders were swept up by police. BuzzFeed reported DHS published new requirements for immigration files, including: social media handles, aliases, associated identifiable information, and search results. The rules take effect October 18. The new policy will cover not only new immigrants, but also green card holders and naturalized citizens. The policy will also affect US citizens who communicate with immigrants. In February, the Office of Inspector General issued a report which found the DHS pilot programs for using social media to screen applicants for immigration lacked criteria to determine if it’s effective. NBC reported the Trump regime wants to lower the number of refugees allowed into the US to 45k in 2018, down significantly from 110k in 2017, and lower than the State Dept’s recommended 50k in the travel ban. Boston Globe reported 50 immigrants were arrested in MA as part of nearly 500 rounded-up nationwide in sanctuary cities and in the case of MA, a state that did fall in line with Trump’s aggressive deportation policies. Reuters reported the number of immigrants without criminal histories arrested by ICE is up more than 200% since Trump took office. Trump’s DOJ is demanding private account information for thousands of Facebook users in three separate search warrants targeted at anti-administration activists. Three activist leaders are named. One leader, Emmelia Talarico, operated the disruptj20 page where Inauguration Day protests were organized and discussed. The page was visited by roughly 6k users. DOJ has also sought info from Dreamhost. Daily Beast reported documents obtained under a FOIA request strongly suggest ICE agents are using private information obtained by NSA surveillance in their investigations. Politico reported immigration judges sent to the US-Mexico border to speed deportations by Trump are finding their caseload nearly empty, while full caseloads back home are left unattended to. Ten confederate flags posters with cotton attached to them were found at American University Tuesday night. Franklin Township in Ohio, a state that wasn’t part of the confederacy, will reinstall a confederate monument taken down in the wake of Charlottesville. An article in Columbia Journalism Review argued “given the surfeit of evidence,” including most recently Trump’s “castigation of NFL players,” it is appropriate to use the term racist about Trump. David McCraw of the Palmetto Restaurant and Ale House in Greenville, SC said his restaurant will ban all NFL games until the protests end. In a letter to students and parents, the principal of Parkway High School in LA said athletes must “stand in a respectful manner ” during the National Anthem, or risk losing playing time or being removed from their team. Trump’s DOJ argued employees can fire people because of their sexual orientation. The DOJ inserted itself in a case opposing the Equal Employment Opportunity Commission which backed Donald Zarda, who was fired by Altitude Express for being gay. BuzzFeed reported HHS announced, for the first time, the department’s ten regional representatives will not help states with planning for the upcoming open enrollment period of Obamacare. In a letter, Oklahoma officials blamed the Trump regime for rising health-care premiums after the regime missed a deadline to approve a waiver that would have reduced premiums by 30% for 130k residents. Starting Wednesday and continuing, Trump repeatedly blamed the failure of the latest GOP Obamacare repeal attempt on a US senator being in the hospital, confounding his own aides. No senator is in the hospital. On Monday, at a rally in Alabama for Luther Strange featuring Pence, campaign staffers informed reporters they couldn’t leave the pen to interview voters. On Tuesday, at a speech at Georgetown Law, Sessions criticized US universities for being “politically correct” and infringing on students’ free-speech rights. Students and faculty protested Sessions speech by taking a knee outside the speech; but ironically many were not allowed inside. Chuck Rosenberg, the acting head of the DEA, resigned Tuesday, saying Trump has little respect for the law. Rosenberg has served under both W. Bush and Obama, and served twice as Comey’s chief of staff. Politico reported even after departures of many Trump aides this summer, many who remain are reaching out to headhunters, lobbyists, and GOP operatives for help in finding new jobs. USA Today reported information on Ivanka’s China supply chain has disappeared since she took a senior role in the Trump regime. Tracking data has vanished, leaving the identity of 90% of shipments a mystery. Ivanka’s business secrecy obscures whether China is using business ties to try to influence the White House — and whether Ivanka could profit from Chinese government subsidies while destroying American jobs. On Monday, in a speech to an oil industry group, Sec. Zinke said nearly one-third of Interior’s employees are not loyal to Trump. He also said he is working to make the department’s culture more business friendly. After campaigning for McConnell in KY in Week 45, Gorsuch addressed a conservative group at the Trump Hotel DC amid protests and criticism for speaking at a venue that is the subject of several lawsuits against Trump. Sunlight Foundation reported Trump National Golf Club in DC hosted the Turkish Airlines World Golf Cup in September, again raising Emoluments Clause concerns. The Turkish government owns 49% of Turkish Airlines. WAPO reported at a private dinner Tuesday, Trump told attendees he thoughts his calling Kim Jong Un “Rocket Man” at his address to the UN would be seen as a compliment, not an insult. Politico reported Kushner used a private email set up last December to communicate with regime members about government business. Kushner’s lawyer said fewer than 100 emails were sent or received from January through August, but failed to address December, a month when Kushner had undisclosed meetings with Russians. On Monday, NYT reported that six WH advisers (Kushner, Ivanka, Cohn, Bannon, Miller, Priebus) used private emails accounts to discuss WH matters, sparking charges of hypocrisy. While four advisers used commercial email services like Gmail, Kushner created a domain, IJKFamily.com in December 2016 for himself and Ivanka. On Monday, Rep. Elijah Cummings, the top Democrat on the House Oversight Committee, announced he is investigating Kushner’s use of personal emails. CNN reported Kushner didn’t inform the Senate Intel Committee about the existence of his personal email account during his recent closed interview. Sens. Burr and Warner wrote a letter to Kushner’s attorney instructing him to double-check that he has turned over every relevant document, including those from his personal email account, as well as any other email accounts. Politico reported the WH launched an internal probe of private email use following Politico’s Sunday report. Of particular interest are Kushner and Ivanka’s use of a private email domain. WSJ reported McGahn considered resigning last summer over lack of protocols for meetings between Trump and Kushner, and concern the meetings would be construed by Mueller as an effort to coordinate stories. Reuters reported in a letter, McCain and Cardin cited that two months after signing it, Trump has not begun enforcing a law imposing new sanctions on Russia, Iran, and North Korea. The letter also noted the Trump regime has not yet provided information related to Russia’s defense and intelligence sectors required under the measure. That information is due tomorrow. WAPO reported Obama met privately with Mark Zuckerberg at a world leaders meeting in Peru on November 19 to warn him if Russian interference wasn’t addressed, it would get worse in the next presidential election. Facebook contacted the FBI in June 2016 over concerns of Russian espionage after tracking a hacking group, but failed to recognize Russian operatives were pumping propaganda using ad micro-targeting. WAPO reported Russian operatives used targeted messages on Facebook to exploit racism, anti-Muslim and anti-immigrant sentiments, and to sow chaos among Americans during the 2016 election. The divisive themes used by Russian operatives on Facebook mirrored those used by Trump and his supporters on social ­media and on right-wing websites. Investigators are looking into the possibility of coordination. BuzzFeed reported Bannon plotted to infiltrate Facebook by getting a spy through the company’s hiring process. The idea came from Chris Gacek, a former Congressional staffer who now works at Family Research Council. Politico reported that in addition to Trump, Russian-funded Facebook ads also backed Stein and Sanders. Daily Beast reported Russian operatives impersonated real American Muslims in a Facebook group United Muslims of America named after a real nonprofit, and shared fake memes about Hillary, McCain and more. CNN reported Russian operatives bought ads on Facebook which referenced Black Lives Matters and targeted residents of Ferguson and Baltimore. The ads were meant to sow discord among Americans. Congressional investigators are examining the sophisticated targeted by the Russian operatives, and questions arise on whether they knew how to target their ads because of collusion with the Trump campaign. Paul Horner, a leading purveyor of fake news during the 2016 election, was found dead of an apparent drug overdose. He was 38. Horner told WAPO in 2016 he thought Trump won the White House because of him. Mother Jones reported on a new study which found Russia concentrated million of fake news tweets to 27 states, 12 of which were swing states including PA, MI and FL where Trump narrowly won. NYT reported Russian operatives relied heavily on Twitter to influence the 2016 election. The platform was used for large-scale automated messaging using “bot” accounts to spread false stories and promote news articles. Russian operatives’ use of Twitter continues, including this week when a network of accounts activated around Trump’s admonishment of the NFL. These accounts continue to identify divisive issues and fan the flames. Twitter met with House and Senate investigators who are probing Russian interference. The company found roughly 200 accounts believed to be tied to the same Russian operatives who bought ads on Facebook. Twitter handed over copies of all sponsored tweets purchased by Kremlin-backed news agency RT. Twitter said RT spent $274k on ads in 2016. WSJ reported Google is conducting a broad internal investigation to assess whether Russian operatives used its ads or services to try to manipulate voters. The company is also talking with Congressional investigators. On Tuesday, the Trump regime denied a request by Puerto Rico to waive the Jones Act in order to ease shipping restrictions and help get fuel and supplies to the island. Trump had waived the act during Harvey and Irma. On Tuesday, McCain asked the Trump regime to reverse course and waive the Jones Act to help the Puerto Rican people. On Wednesday, amid uproar, Trump said he was reluctant to waive the Jones Act, citing “we have a lot of shippers and a lot of people that work in the shipping industry” who are opposed to lifting the act. Bowing to public pressure, Trump finally waived the Jones Act on Thursday, announced through a tweet by press secretary Sanders. Lawmakers said Trump’s 10-day Jones Act waiver is not enough for Puerto Rico. Several members of Congress are pushing for a one-year period. Cummings, the ranking dem on the House Oversight Committee and Placket of USVI called for an emergency hearing on Trump’s hurricane response to Puerto Rico and the USVI. The Katrina hearing was cited as precedent. On Friday, the general in charge of relief in Puerto Rico said there are “not enough” troops or equipment to place to help. Trump also sent a series of tweet before and after his golf game Saturday blaming the “Fake New Media,” working in conjunction with Democrats, for spreading disinformation and taking away the spirit of our soldiers. Ironically, Trump’s golf course in Puerto Rico filed for bankruptcy, listing assets of $9 million and liabilities of $78 million. The Puerto Rican government’s $33 million investment in Trump’s Coco Beach was completely wiped out. WAPO reported on Trump’s “lost weekend” — after Maria hit Puerto Rico on September 20, Trump spent a long weekend (Sept 21–24) in NJ during which he and his top aides effectively went dark on Puerto Rico. Politico reported Price combined business travel on government-funded private jets with personal travel, including a trip to St. Simons Island for he and his wife where they owns property, and a lunch with his son. On Thursday, Politico reported Price also took military jets to Europe, Asia and Africa with his wife, costing taxpayers over $500k. In total, Price’s travel costs exceeded $1 million since May. On Thursday, Price said he’d pay for ‘his seat’ and write a check for $52k. Late Friday, after Trump said Price is “fine man” but that he “didn’t like the optics.” Price resigned late Friday joining an unusually long list of Trump regime firings and resignations. WAPO reported the EPA is spending almost $25k to construct a secure, soundproof communications booth for Pruitt. No previous EPA head had a similar set up. Pruitt and his deputies have taken other steps to heighten security, including having EPA staff members surrender their cell phones and other digital devices before entering meetings with Pruitt. WAPO also reported Pruitt took charter and military flights that cost taxpayers more than $58k. The EPA’s inspector general announced a preliminary probe into Pruitt’s travels to Oklahoma at taxpayer expense. Politico reported Zinke has taken several flights on private or military aircraft, including a $12k charter plane to his hometown in Montana, and two chartered flights for Zinke and his staff to the USVI in March. WAPO reported Zinke charged taxpayers $12k for a flight on a private plane owned by oil executives. WAPO reported VA Sec Shulkin took a 10-day, taxpayer-funded, trip to Europe in July with his wife. Shulkin had four days meeting, and the rest was spent on vacation including Wimbledon, a cruise and sightseeing. CBS reported Trump kids’ ski vacation to Aspen in March cost taxpayers more than half a million dollars, including $330k in security costs, $196k in lodging and tens of thousands in other expenses. On Wednesday, Trump launched his tax plan saying, “I don’t benefit. I don’t benefit.” NYT reported, based on two pages of his 2005 return, Trump could save more than $1.1 billion under his new plan. WSJ reported the Treasury Dept took down a 2012 economic analysis which contradicts Mnuchin’s take on corporate-tax cut’s winners. CNN reported after months of being at odds, the IRS Criminal Investigation division is now sharing years of Manafort’s and Flynn’s tax returns with Mueller. It is not clear if Mueller has Trump’s tax returns. CNN also reported the IRS Criminal Investigation division has been working with the FBI to investigate Manafort since before the election in probes that centers on possible money laundering and tax fraud issues. ABC reported Mueller is investigating Russian-American money that flowed into the Trump campaign during the election. Three Americans with significant Russian business connections contributed almost $2 million. Politico reported Pence sent his lawyer to meet with Mueller over the summer to express his willingness to cooperate in the Russia probe. CNN reported Mueller could start interviewing WH staff this week, or possible next depending on scheduling. Spicer hired Chris Mead, a high-powered criminal defense attorney, to represent him in Mueller’s Russia probe. BuzzFeed reported Tillerson and Lavrov had a 45 minute private meeting. Under Sec. Tom Shannon, US official for Europe Elisabeth Millard, and other US officials were excluded, and a full readout was not provided. After the candidate he backed in the Alabama, Luther Strange, lost the senate primary Tuesday, Trump deleted his tweets supporting Strange. Roy Moore, the winner in Alabama who was backed by Bannon, is so extremist in his racism, xenophobia and homophobia, many Republicans when asked simply claimed they had never heard of him. Corker, a Trump ally during the 2016 campaign, became the second Republican to unexpectedly announce he will not seek re-election in 2018. A Quinnipiac poll found 69% of Americans think Trump should stop tweeting from his personal account, and 57% think he is not fit to serve. Trump waited four days to call Merkel and congratulate her on winning re-election. Merkel had called Trump on November 9, one day after he won the presidency. Fifty days after Trump announced he was going to declare the opioid crisis a national emergency, he still has not made it official. 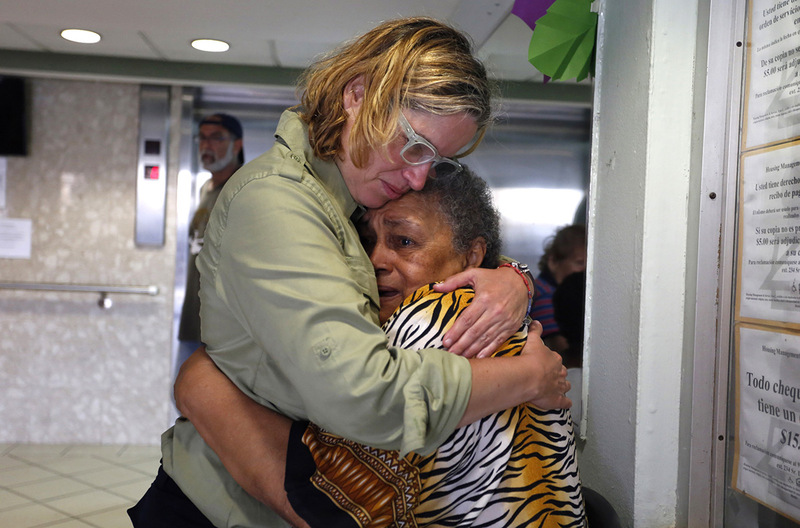 San Juan Mayor Carmen Yulín Cruz embraces a resident in the aftermath of Hurricane Maria.